Raith Rovers defender Craig Barr savoured every moment of his return to first team action on Saturday after fearing that he may never pull on his boots again. In a repeat of last season, it has taken the 28-year-old until the end of February to make an appearance for the Kirkcaldy side after another campaign blighted by injury. With three centre-halves suspended, Barr was thrown in against Livingston despite being short of match fitness, having completed just one full 90 minutes in the development league since his last top team game over nine months ago. However, the former Livingston, Gretna and Airdrie man issued a reminder of his capabilities, turning in a solid display to help the team to a clean sheet in a 2-0 win. “It was fantastic to be back out there,” Barr said. “It came as a bit of a surprise and out of the blue, with the suspensions last week. “I was just keeping my head down and trying to get back to fitness but, for once, I had a bit of luck in my favour after the last two seasons and I was thrown back in there. “I don’t want to dwell on the past, I want to put it behind me. If I can help the gaffer in anyway I can and do well then, if I am to maybe leave at the end of the season, I’ll be able to leave on a high, rather than reflecting on the injuries. “It’s been terrible, so difficult. The hardest thing is trying not to take it home and let it affect your social life and family life. I have a son now and that has helped give things a bit of perspective and forget about football sometimes. Barr managed only 13 appearances last season after missing the first six months of the campaign following surgery to remove fragments of bone from his knee. His impressive performances led to a new contract, and a second season at Stark’s Park, however a pelvic problem has once again forced him onto the sidelines. There have been some dark days on his road to recovery, but with the help of club physio Stuart Phin, the defender has once again battled his way back to fitness. “Did I ever feel like I wouldn’t get back? Yes, I did,” Barr confessed. “It is hard not to think like that. “But people at the club have helped me get through, paid for scans and injections and the physio, Stuarty, has been brilliant with me. Barr hopes now to ditch the injury-prone tag and restart his career, whether that be at Stark’s Park or elsewhere. “I want to put it all behind me,” he said. “I’m not a player who, over the years, was injured often. I’ve just been unfortunate that my time at Raith has been hampered by injuries. 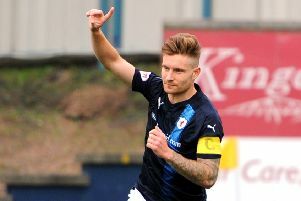 “I don’t want to be known as ‘the guy who was injured’, I want the Raith fans to remember me as a guy who was a good player and gave his all for the club. “From now on I want to kick on and - whether it is at Raith or elsewhere - and prove my injury problems are behind me. I want to play regularly and get back to enjoying the game again.